An evaporative cooling for any level of comfort. No matter how big an area you need to cool, Portacool has an evaporative cooling solution. 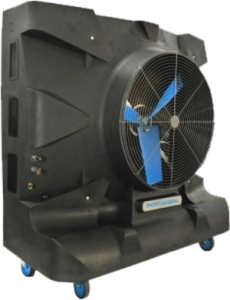 Portacool offers the first version of a portable evaporative cooler designed to provide economical, effective cooling where ever it is needed. These portable evaporative coolers have proven highly effective in unlimited uses ranging from agricultural and horticultural applications, manufacturing, industrial, business, automotive, sports, home, and lobby – anywhere cooling is needed and traditional air conditioning is impractical or cost prohibitive.